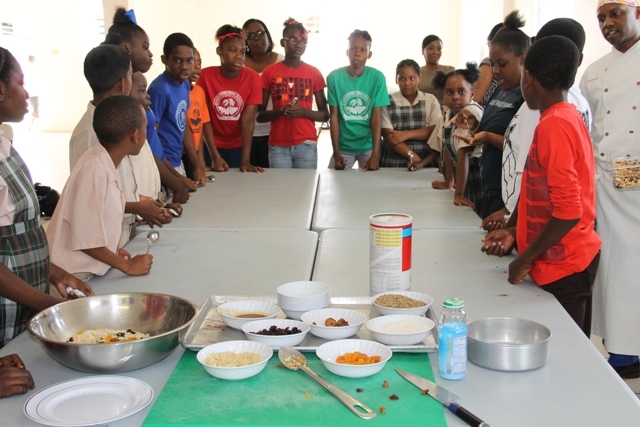 NIA CHARLESTOWN NEVIS (February 24, 2015) — Charlestown Primary School students between the ages of nine and 12 had the opportunity to learn the importance of a healthy lifestyle, at a Mini Chef Academy held at school’s kitchen on February 24, 2015. 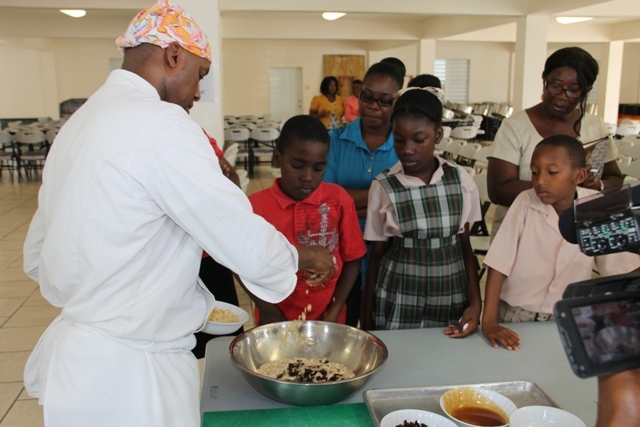 The event was held from 9:30 to 11:30 a.m. as part of the School Meals Programme, courtesy of the Rouse Foundation in collaboration with the Nevis Island Administration (NIA). 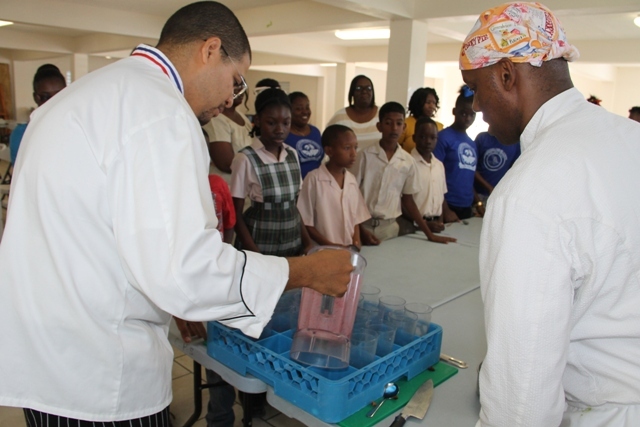 The session was led by Food and Nutrition Specialist attached to the School Meals Programme Executive Chef Michael Henville, and celebrity Chef of Atlanta Marvin Woods who worked with First Lady Michelle Obama, in her School Meals programme in the United States of America. Permanent Secretary in the Ministry of Health Nicole Slack-Liburd explained that students of a specific age range and family health background were selected to benefit from the session to teach them about healthy eating as an alternative to unhealthy snacks and to learn how to prepare healthy snacks. She noted that it was important to teach the students about the need for behaviour change and healthy lifestyles so they would be better placed to take the message to their homes and family. 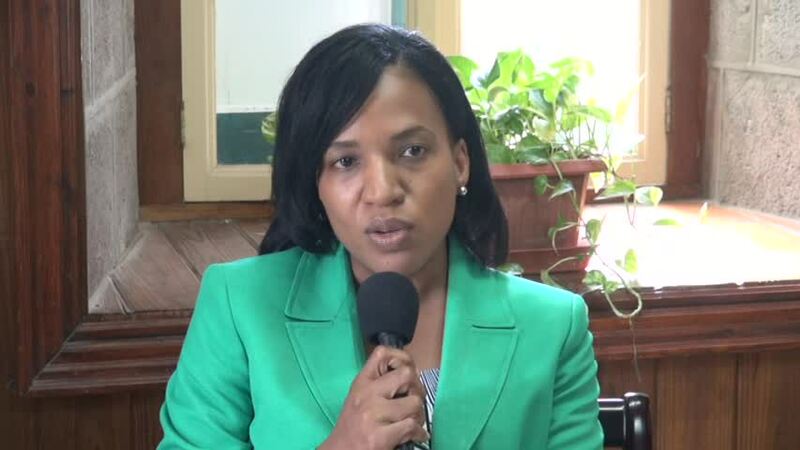 Slack-Liburd said it was more difficult to introduce those matters to adults and hence the Ministry’s decision to target that age in the school’s population. 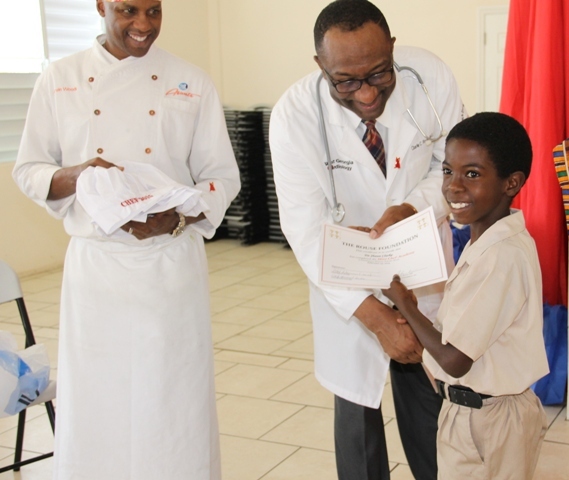 At the end of the demonstration, each participant received a certificate of completion and chef gear. The school also received a hydroponics system as a gift from the Rouse Foundation. It will be used to cultivate vegetables for use in the School Meals Programme at the Charlestown Primary School and other schools on the island. Cardiologist and Head of the Foundation Dr. Charlie Rouse, was accompanied by his wife Gerontologist Deidre Rouse, Usula Phillip and Rosalind Smith at the demonstration and while on Nevis for a three-day mission, he will be involved in other activities. Slack-Liburd urged members of the public to take advantage of a cardiac health screening session by the Foundation from 6 to 8 p.m.at the Cherry Gardens hard-court. She reminded that persons interested in attending the screenings, should ensure they fast for at least six hours before the event. She said the activities for the February visit by Dr. Rouse and his foundation would bring to end the Ministry’s World Cancer Day activities for 2015. World Cancer Day is commemorated annually on February 4. The Rouse Foundation has been in partnership with the Ministry of Health on Nevis since 2013 and, to date, has conducted three successful missions (September 2013, July 2014 and September 2014) with the island’s population.